A day that has lived in the playground of your imagination ~ is now a reality! Now the fun begins, come on in and see what's new in our Mother of the Bride Collection. We specialize in this line and have lots of options, sizes, colors, textures - all made with impeccable quality. Add even more JOY to this very important occasion - and don't forget to accessorize. We invite you to stop by Joy's to see our full Collection. Daymor Couture, Teri Jon, Ursula of Switzerland, Scapa, Bigio, Soulmates. This vibrant navy Evening Gown with a Lace Bodice, and Silk Gazar Overlay is both unique and elegant. An illusion neckline, ¾ sleeves and A-line skirt will surely have you dancing the night away! 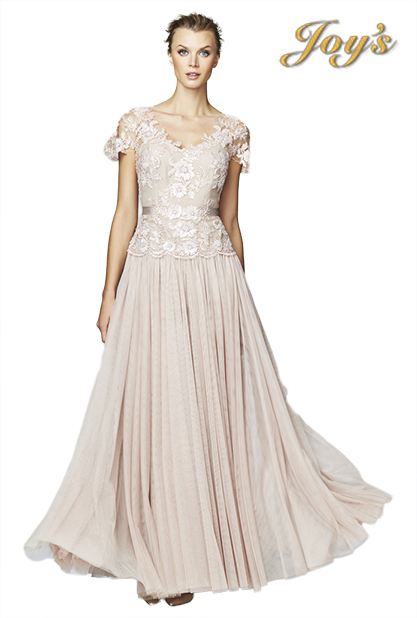 Stunning Soft Rose Cap-Sleeved Beaded Lace Bodice and Tulle Skirting with Satin Ribbon Belting is simply beauty in motion. Additional colors: Emerald, Sterling Grey and Black. An embellished, scalloped lace and mesh overlay creates the illusion top of this exquisite gown with jeweled, ruched waistline and flowing floor-length skirt. Camisole bodice with embellished overlay. High neckline. Three-quarter sleeves. Jeweled, ruched waistline. Flowing chiffon skirt. Back-zip with button-and-loop closure. Lined.